At 5:02 PM EST, three astronauts will be blasting off aboard a Russian Soyuz spacecraft from Baikonur Cosmodrome in Kazakhstan. Six hours later, they’re expected to dock at the International Space Station, beginning a five-month stint in orbit. The international crew includes NASA astronaut Kjell Lindgren, Russian cosmonaut Oleg Kononenko (a space veteran) and Japan’s Kimiya Yui. 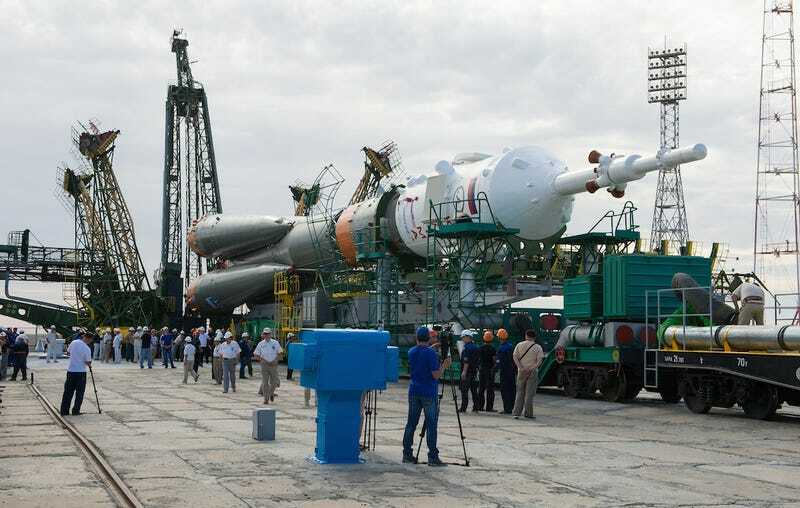 The three were originally supposed to head up to the ISS in May, but their launch was delayed after a Russian robotic Progress 59 cargo craft spiraled out of control after launch and crashed back to Earth, apparently due to a malfunction in the third stage of its Soyuz rocket. The Russian space agency, NASA and other partners decided (quite rightly) to thoroughly investigate the cause of the problem before sending humans up on a similar craft. Now that all systems have been double and triple checked, the launch is a-go. The three astronauts will join NASA’s Scott Kelly and Russian cosmonauts Gennady Padalka and Mikhail Kornienko, who are currently holding down the fort at humanity’s one-and-only orbiting laboratory. The extra hands will allow the space crew to make much more rapid progress on some of its vital scientific research projects.